I take umbrage with the marketing wizard that proclaimed Disney World as The Happiest Place on Earth. The happiest place on Earth is not a place you visit a few or less times in your life. The happiest place on Earth doesn't require plane rides or multiple day car trips. And the happiest place on Earth doesn't necessitate an empty savings account or listing body parts on Craigslist. No, the happiest place on Earth is somewhere that you can visit as frequently as you want and whenever you want; but it can still, for some reason, make you smile when you think about it. It’s a place that if you’re having a bad day you can drop everything you’re doing and travel to; and if you do require your wallet, it won't echo when you put it away. And the happiest place on Earth is not the same for everyone, it's personal, it's YOUR happiest place. For me the happiest place on Earth is a wonderful little breakfast diner not too far from my house called Norval Pancake Factory; quietly snuggled between Brampton and Georgetown Ontario, on the only intersection in the hamlet of Norval. This is my favourite restaurant. I love everything about it. And truthfully (or shamefully?) any plans to go leave me visibly excited and filled with anticipation. It's a quaint little place, cozy decor, with an incredibly friendly and delightful wait staff. Although I don't know their names and they don't know mine (I should change this) whenever I walk in I am instantly recognized, greeted with a smile, and seated. This is provided that there is a table available when I show up. You see they get very busy, very quickly. On any random Wednesday morning you could find a line of ten people at the door. Word of their awesomeness has obviously spread :). I would classify myself as a “semi-regular.” I live far enough away that I cannot justify a weekly trip (I also enjoy fitting into my pants) but close enough that I try to visit once a month. I have been doing this for almost two years now (come August). 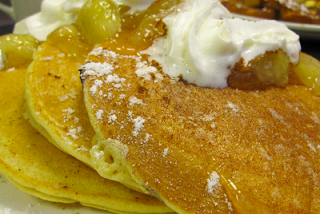 Of course aside from everything else, the reason I keep coming back is that their pancakes are the best. As a baker, the sad irony of my existence is that I can't make a decent batch of pancakes to save my life. I can make the batter (who can't? ), but as far as cooking it? Let’s say that Wile E. Coyote had better luck with the Road Runner. 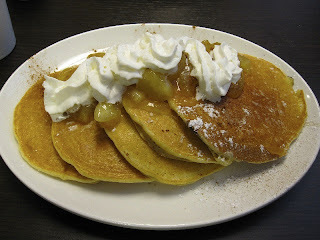 In fact, I love their pancakes so much that it’s all I have ever ordered. They have every type of breakfast dish you could want, and I hear they're all good, but when it comes down to it, pancakes trump all. I have asked and been told that their pancakes are a cross between their own mix and a packaged mix. This perhaps explains the unique (and awesome) flavour and texture that I could never hope to recreate at home. When they come to your table they have a slightly crisp “crust”, but are soft and moist on the inside. They’re not super light but not dense either, and they have good flavour all on their own. In fact I will normally eat at least one without syrup. There is plenty of variety too. My standard rotation is Cinnamon Apple, Blueberry and Plain. I used to be all about Blueberry but this year has become the year of Cinnamon Apple (also the first thing I ever ordered). 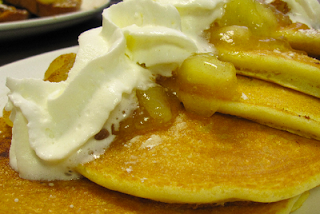 It's like having warm apple pie slathered on your pancakes (featured in the pictures and currently craving). And when your pancakes arrive at your table there are FIVE of them. Yes FIVE! So good. So filling. And to top it off the prices are also astoundingly good. How often in your life do you say that? I remember the first time I went, my brother joining me, and we couldn't believe how much food showed up at our table. Upon ordering we even thought that it might not be enough (big talk) until wide eyed, we saw the stacks on our plates (my brother ordered Banana Bread French Toast). We left extremely happy and super full. I remember the first time I took my parents and my mother's shock at her breakfast and her low whispers of “Adam; they gave me three eggs. They never give three eggs.” And I had an amazing time this past Christmas when I convinced my two uncles and Grandfather to join my father and I for breakfast. We all had pancakes. In fact, we had too many pancakes. There wasn't enough room for all of them on the flattop and my uncle had to wait a few extra minutes for his breakfast; and yet was still able to finish first (I guess that huge mouth of his does come in handy sometimes :) ). We had a great time and my Uncles and Grandfather agreed it lived up to my hype. So you know what Disney? No. My Happiest Place on Earth is a place where I can sit down and relax with great coffee (really great coffee), atmosphere, service, a friend or family and fantastic pancakes. And it's just a few minutes away. No long trips, no overpriced merchandise, just a happy place. On any given day you could ask me to go, and I will go, I really do love it that much. And I also love sharing it with others. Everyone I recommend it to can't believe how good it is and trust me when I say that I recommend it often :). My apologies if you don’t live near enough to visit Norval Pancake Factory, but take a look around your own area or go online and see if you can’t find a little gem of a restaurant somewhere near you. Who knows, it might even become your Happiest Place on Earth. yum! blueberry pancakes are my happy place! My kitchen is my happiest place on earth. I can make whatever I want, I don't have to tip, and I don't worry about anyone spitting in the food. PS - Happy Belated Birthday! I've finally got a chance to read your blog and its awesome! Glad you love coming to eat at the restaurant so much and I'm glad we give you great service, especially me riiiiight!?!?! hahaha. Hope your house closing went well today! You won't be able to afford to come as often now with a mortgage, even though you will be very close! By the way if you didn't know... My name is Erica! Guess I will see you around. Hey Erica :) Glad you finally got a chance to take a look and now you understand the depths of my obsession with your restaurant (for good or bad I suppose :) ). The house closing went surprisingly smooth (thanks for asking) but don't worry, I have a pancake fund :). And I did know your name :), if only because you usually take my order (maybe only a couple of times you haven't in the last 2 years) and the fact that your name is on the receipt :). And yes, especially you, you've never given me a weird look for all the strange pancake related questions I've had for you :). Take care, and I'll likely see you the day after thanksgiving :). You should definitely go, it's so worth it. I haven't had a chance to get down there this month even though I live so close. I need to remedy that soon :). Sorry about the recipe mix up :), I don't think I could make them even if I tried :).